Another entrant in the highly competitive zombie wars, former actor (The Young and the Restless) Ryan Brown’s debut effort, Play Dead (Gallery Books) is competent, sometimes compelling, fairly innovative and sometimes quite funny. In the end, however, it just isn’t as good as it cou ld have been. Part of the problem is with the premise itself. 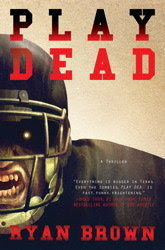 In Play Dead, you know up front that we’re going to be mashing two big American tropes -- high school football and zombies. But once you know that, as well as the fairly simple set up, you're pretty much there. Let’s face it (and this is, perhaps, another problem) how much heart and soul is a frankly funny novel about football zombies going to have? At the same time, this criticism can also serve as praise. After all, we’re not always looking for a lift for our brow. Sometimes we just want to enjoy an engaging story. Sometimes, for want of a better word, we just want to escape. Play Dead certainly accomplishes that. There’s something almost eerily compelling about the book: the pay-off might not be huge, but Play Dead delivers a highly enjoyable journey, if you can suspend your belief and leave it at the door. “Friday Night Lights meets Dawn of the Dead,” says Brad Thor in one of two blurbs from that author. And that pretty much sums it up perfectly. What you need to decide is: do you care?